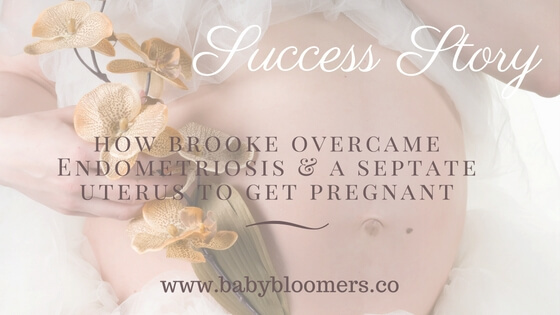 Brooke came to us in March after trying to conceive for some time unsuccessfully and getting some terrible news from her medical team. She joined the program and worked with her coach and Naturopath 1-on-1 to customize a plan specific to her fertility needs. 3 months later, she conceived. Her story is powerful and beautiful and worth sharing for any woman out there who has been told that their dream was impossible. Here is her story. Congratulations to Brooke and her Baby Boy on the way! After getting married in February 2015 my husband and I decided to start trying for a baby right away. We were both very active and healthy and neither of us had ever been diagnosed with any major heath problems. I downloaded a fertility app to start tracking my cycle and learned that my cycle was pretty regular, which excited me as I thought this for sure meant I was going to get pregnant right away, no problem. After about 9 months TTC with no luck I went to see my family doctor to discuss this with her. She immediately started asking me questions about my cycle in detail and due to the heaviness and severe cramping with clotting I was getting with my periods she determined that I had endometriosis and suggested I see a gynecologist as well as get an ultrasound done to check internally to make sure there was nothing else more serious going on. Immediately I started googling and trying to understand what this even meant and how this was effecting my fertility. About a week later I had my internal ultrasound done and I could tell by the way the technician was acting that something wasn’t right. The next day I received a call from my doctor saying she needed to see me to discuss my ultrasound. At this point I was so nervous thinking that something was seriously wrong with me. I remember saying to my husband I just knew that something was wrong and felt that I was really letting him down by being “defective”. A few days later I arrived at my appointment and my doctor sat me down to tell me that they found a septate in my uterus and explained that this can make it extremely difficult for an embryo to successfully attach to my uterine wall (which was likely the reason in addition to the endometriosis that I was unable to get pregnant). She further went on to tell me that I had a 90% chance of miscarriage if I was able to successfully conceive and suspected that I had been having recurrent early miscarriages for the past few months without my knowledge. At this point it was all a blur. I remember hearing the words “infertility” and felt sick to my stomach. I left the appointment in a daze with papers and instructions to wait for my Gynecologist appointment to discuss a type of surgery that can remove the septate and be able to successfully conceive. I remember feeling heartbroken knowing how badly my husband and I wanted a baby, and knowing it was my fault that it couldn’t happen was devastating. At the time I was working with my naturopath on some hormonal issues and at our next appointment I discussed everything I had learned about my condition over the last few weeks. Immediately she talked me down and came up with a natural treatment plan to both address the endometriosis and the septate uterus. At this point she also told me about Baby bloomers, a new natural fertility program that her and a fellow ND were just starting up for women just like me who had problems with infertility. Immediately following that appointment I felt so much better knowing that there was something out there that gave me hope and was natural. I was willing to try anything at this point. Immediately after that appointment I started taking some supplements to try and cleanse and clear out my uterus, as well I gave up Dairy, Sugar, Meat and Gluten. I was determined to fight this thing naturally. Once I started the Baby Bloomers program I stuck to my new way of eating as well as incorporated all of the suggested supplements & the fertility massage. For me the biggest change I learned during the Baby Bloomers program was changing my mindset and starting my day with positive affirmations. 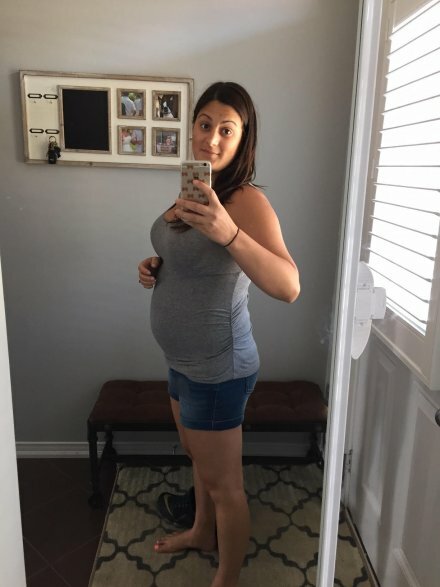 Instead of thinking that I was never going to get pregnant and thinking that I had no hope other then this surgery that I really didn’t want to have to do, I started thinking that I can do this and that with the support of the Baby Bloomers and all the amazing information at my fingertips I would get pregnant naturally. After about 3 months of sticking to the program religiously, following every piece of advice they had given me ( the massage, the exercises, the supplements, dietary changes, positive affirmations etc. ) I was starting to notice a significant change in my cycles and all of the previous endometriosis symptoms I had in the past were gone. It was mothers day weekend and I wasn’t feeling very well; I was nauseous had a headache was so tired and just felt off. I thought I was coming down with a bug and decided to take a nap. When I woke up and went to the bathroom I noticed some spotting, which was totally abnormal for me. I thought maybe I was getting my period, as my cycles had changed over the last few months. I quickly checked my app and realized my period was late, which again I thought was due to all the changes to my cycle recently. The optimist in me decided I would take a pregnancy test just in case, since at this point I had bought them in bulk and definitely had a few to spare. I told myself not to get my hopes up that it was unlikely that in just 3 months I could have corrected years worth of problems and become pregnant. As soon as I peed on the stick two lines appeared, my heart stopped and I thought I was going to faint. I immediately took out two more tests ( one was a different brand ) and repeated the test two more times, both POSITIVE. I think I must have fainted or something because next thing i knew my husband was upstairs asking if everything was ok, I barely got the words “i’m pregnant” out and showed him the 3 positive tests. I immediately called my doctor and naturopath to set up appointments to make sure that this was really happening and to make sure that everything was ok. I saw my family doctor on the Monday and she confirmed I was in-fact pregnant with a urine test. Due to the problems I had my doctor sent me for an ultrasound at 7 weeks to ensure that the embryo was not implanted on the septate and that the pregnancy was viable. I remember showing up to my ultrasound with the worst anxiety I had ever had, preparing myself for the worst. When I layed down on the bed and the ultrasound started I started to hold my breath, and then all of a sudden I saw the flickering on the screen, the baby had a heartbeat and the tech said that the pregnancy was viable and everything looked perfectly healthy. Immediately i felt a huge sigh of relief and started crying. Fast forward a week, I had a follow up with my family Doctor to go over the results. Not only was the pregnancy viable and healthy the ultrasound had revealed that the septate that was previously in my uterus was gone. I remember my doctor looking a bit stunned as she was reading the results. I completely credit this to the Baby Bloomers program. It seems that all the changes I had made to my lifestyle and diet not only cleared up my endometriosis but it somehow managed to cleanse my uterus of this septate that I was told I would need surgery to remove. I am now 23 weeks pregnant and everything has gone perfectly during my pregnancy this far, everything with me and my baby is perfectly healthy. I am due to have a baby boy January 14th.